Since attending Cat’s Coding Evening at Twickenham I have been absolutely buzzing with ideas and enthusiasm. I would like to take this opportunity and thank Cat so much for organising such an amazing event for people like me, new in the Computing teaching world(started this September…that kind of new). I have gained so much confidence that I have now organised a Code Week, complete with special guests, and I have to say Cat has been there offering support and giving me some wonderful tips and ideas along the way. Thanks for letting me know how things are going and keep up the good work! Take a look at this post on my personal blog for a worksheet I’ve just made to introduce basic coding using a Raspberry Pi! It’s been a couple of weeks now since we hosted our most recent Coding Evening in Twickenham and I’m still reeling from how amazing it was! Firstly, our venue, The Stokes and Moncreiff in Twickenham, had been renovated courtesy of Coca Cola for the Rugby World Cup and so the room we usually use was brighter and more inviting than usual; the whole atmosphere of the pub felt more upbeat and welcoming! Secondly, we were joined by PiTop, who not only had their recently finished PiTop laptop ready to show us, they brought along a sample of their newest product, a Raspberry Pi monitor and case which reminded me of an iMac for some reason. They also demo-ed a cool eighties-style RPG to learn command line, which was pretty fun and would appeal massively to children (quite a few of the adults were keen to give it a go too). We were pretty lucky to have a chance to have a play with both their products and are looking forward to seeing them at our Coding Evening Special at Mozilla this week! Most excitingly, the generous pirates at Pimoroni offered to buy attendees their first drink, which meant that everyone could enjoy a relaxing beverage without breaking the bank – for some reason this seemed to appeal to a lot of the teachers in the room who were really happy to relax with a pint (of coke of course…honest). Thank you pirates, we are so, so grateful for all of your support! The atmosphere in the room was best described as excitable, as we saw guests ranging from complete novices, to Python software gurus. We were pleased to welcome CAS Regional Coordinator for London, Jane Waite, three graduates from the recent Skycademy held at the Raspberry Pi Foundation in Cambridge along with a host of new attendees; September turned out to be our most successful evening yet and we’re excited about our upcoming special event in Mozilla now. Keep an eye out for some special announcements soon about this upcoming sell out events as well as some future events and more Coding Evenings around the country. We are so lucky to get so many fantastic volunteers who give up their time to help out at Coding Evenings and the next few events are no different! At Peterborough Coding Evening on Tuesday 22nd September, organisers of CamJam and Raspberry Pi gurus Tim Richardson and Michael Horne along with co-author of Adventures in Minecraft, David Whale. At Twickenham Coding Evening on Thursday 24th September, Python and Pygame guru, Tim Golden, Active Lit creator Alex Warren and arduino expert Ben Dornan along with regular guests and ever willing all star volunteers Richard Hayler, Nic Hughes and Marc Grossman. At our special event at Mozilla for Code Week EU, we are excited to welcome both Fuze and PiTop with demos of their hardware for using Raspberry Pi in the classroom, as well as Code Club London Coordinator Dan Elwick. We’re really excited that so many people are willing to give up their free time to help support us all with the teaching of coding in the UK and hope to see lots of you there! We are pleased to be able to announce that we will be hosting a special Coding Evening in Mozilla HQ, London for Code Week EU on Thursday 15th October. This will be an excellent opportunity for existing members of both Coding Evening Twickenham Coding Evening Peterborough to come together & meet as well as for anyone interested in running their own Coding Evening to meet us and get a better idea of how a Coding Evening works. Don’t forget we have both a Twickenham and Peterborough evening coming up in September too! We’re really exciting to have this opportunity to meet somewhere as special as Mozilla and we really hope you can join us! In the year since we graduated #Picademy my fellow graduate @CatLamin has been super busy. Amongst all the amazing stuff she does in our community Cat organises the Twickenham Coding Evening. Cat’s initiative was to set up a relaxed, informal environment in which educators and local community members interested in programming and the new Computing curriculum could come together for a pint and some food, support, networking and resource sharing. as you can imagine the evening was a huge hit. Cat has now organised four events since January 2015 and other members of the Coding and Education communities are starting to contact her about setting up their own (follow the link above if you’re interested) including me! 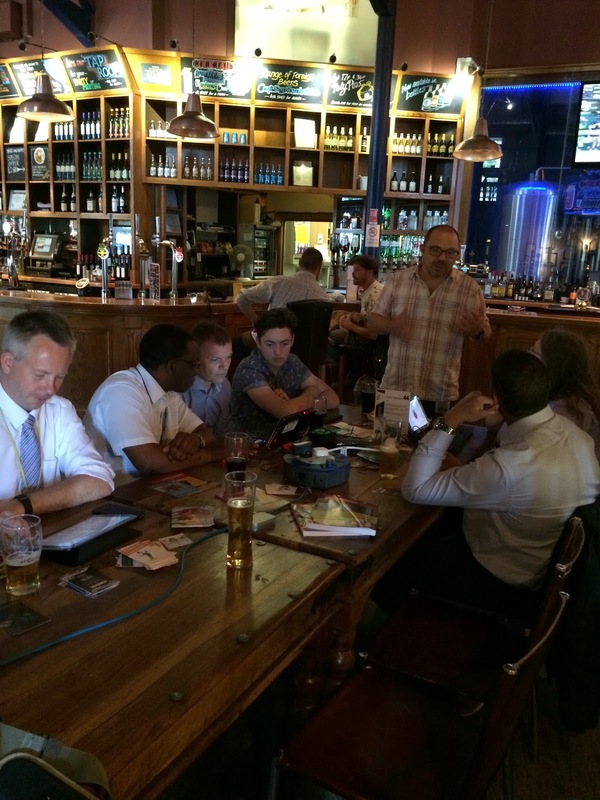 Peterborough’s first Coding Evening took place on July 7th 2015. I reserved out an area of a local pub and we turned it into Geekdom! Our gathering included local teachers, TA’s, potential school volunteers and members of the local community. We were also extremely lucky to have the lovely @Geeky_Tim who is one of orgaisers of @CambridgeJam and also the wonderful @WhaleyGeek who co-authored Adventures in Minecraft and had spent all day with the BBC releasing the BBCMicrobit. We were also lucky enough that he brought along a flip the egg frying pan game that used the Microbit (except I kept calling it a MicroBOT because I’ve been studying Big Hero 6 with my English class). Tim brought along Raspberry Pi’s and HDMI-Pi’s and we had people involved in Minecraft and trying to program RGB LED’s through Scratch. A couple of people went away with a lent out Pi kit on the proviso that they have to come back with it and show us something cool they have managed to do. Discussion was flowing around the new curriculum and what resources people are using and having started at 4.30 those of us that were still going strong at 8pm sat down to get some food. The evening was a great success and as a result I will be running one every two months which seemed to be a regularity that everyone agreed on. So if you’re in or around the Peterborough area please contact me @digitaldivageek (Twitter) or digitaldivageek@geektools.com and come along! Join us for our second coding evening here.